Allele-specific oligonucleotide (ASO) hybridization was first applied to probe genomic DNA samples for the presence of point mutations causing sickle cell anemia and aj-antitrypsin deficiency. In both cases, the authors used nonadecanucleotides (19-mers) as ASO probes. Although one probe was complementary to the normal allele, the second one matched the mutant allele. Because a mismatched base pair decreases the stability of a nucleic acid duplex, appropriate adjustment of the hybridization and washing temperatures permitted discrimination between the normal, mutant, and heterozygous genotype. With genomic DNA samples, this technique could have been used only for the genotyping of single copy genes. Once the polymerase chain reaction (PCR) has been introduced, this approach could be adapted to almost any genomic fragment by using diverse sources of amplifiable DNA. Single nucleotide polymorphisms as well as small insertions or deletions (for simplicity, collectively referred to as SNPs) are the greatest source of genomic variability. Most mutations causing hereditary disorders belong to this category as well. Because of their functional impact and/ or their usefulness as markers in mapping and association studies, SNPs are frequently typed in the context of population genetic surveys as well as in diagnostic and/or genetic epidemiological analyses. 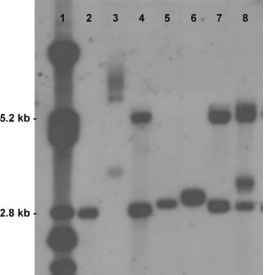 The wide applicability of ASO hybridization (especially in its combination with PCR), the absence of need for costly investments, and straightforward laboratory implementation made this technique very popular as a routine genotyping tool.